No.1 anti-ageing brand Olay Philippines celebrated its many years of helping Filipinas love the skin they’re in at the “Forever Olay” event held at the Manila Peninsula on October 12, 2010. The elegant luncheon gave guests a more intimate look at the iconic skin care brand - by women all over the world, including Filipinas, who fell in love again with their youthful skin through Olay. And their love for Olay remains unchanged through the years like their youthful skin despite the many changes in their lives. The story of Olay began in the early 1950s when a South African chemist Graham Wulff envisioned creating the perfect cream that women like his wife Dinah (and her skin) could truly love. At that time, women had to use thick and greasy skin creams packed in shoe-polish style tins. Learning from listening to his wife, Graham Wulff created a new facial moisturizer that could be quickly absorbed into the skin, providing hydration and protection. Through trial and error, husband and wife fine-tuned everything from the absorption to the texture to the delicate pink shade and fragrance. Thus the legendary Oil of Olay Beauty Fluid was born. Olay Total Effects was conceived from surveying over 6,000 women across the globe. This extensive survey discovered all these women were concerned about similar signs of ageing, namely fine lines and wrinkles, blotches and age spots, rough skin texture, uneven skin tone, skin dryness, skin surface dullness / loss of radiance and enlarged pores. 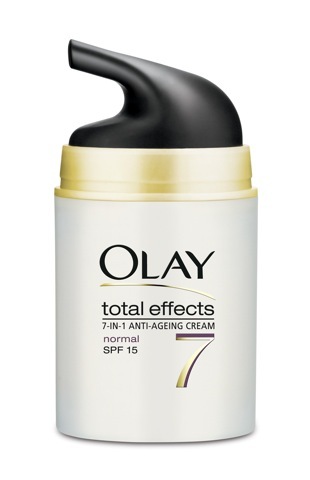 To provide an all-in-one solution to address all these issues, Olay Total Effects was designed to help fight seven signs of skin ageing with a single product. The iconic black-and-gold bottle was first launched in the South East Asia region in 2000, entered the Philippines in 2006, and later went on to provide an extensive skincare line-up that would form the flagship boutique of Olay. The secret behind Total Effects’ enduring success is VitaNiacin, its unique complex of powerful anti-ageing ingredients comprising Niacinamide (Vitamin B3), anti-oxidants (Vitamins E and C) and Panthenol (Vitamin B5), which provide multiple anti-ageing benefits to help skin regain its radiant, youthful glow and fortify itself against seven signs of skin ageing. Proof that Olay Total Effects has lived up to its promise are the brand ambassadors that first launched the brand in 2006 – Miriam Quiambao, Daphne Oseña-Paez, Ines Delgado-Prieto and Menchu Lauchengco-Yulo. From 1st runner-up in Miss Universe 1999 to a thriving show biz career and her own business, Miriam Quiambao is celebrating all the changes in her life. She is a part of Project Lotus, a regional talent search for the next Pan-Asian girl band that’s going to be aired on AXN this 2011. She is the only judge chosen from the Philippines and they’re choosing talents from Philippines, Korea, Japan, China and India. But one thing she’s happy that hasn’t changed is how young her skin looks. She continues to look even younger than most women her age, and even those 10 years younger than her. She underwent a test in June 2010 in Jakarta using the Olay VISIA machine, a digital skin imaging tool that can compare the quality and signs of ageing on a woman’s skin versus those of other women her age, or women even younger than her. The results of her spots and wrinkles showed that Miriam actually looked younger than 9 out of 10 women in their twenties. TV host Daphne Oseña-Paez has also had a host of changes come into her life in the past four years – another daughter, becoming a UNICEF ambassador for children and expanding her line of linens and furniture called Daphne. “My work in Urban Zone really made me want to expose design to a larger audience so I started a number of home lines, which is represented by my brand Daphne,” she shared. Her work with UNICEF gives her also the opportunity to help others as a Special Advocate for Children. “It’s a national position focusing on major goals under the Millennium Development Goals – number one is to reduce the number of maternal deaths, and number two, to promote breastfeeding which is directly linked to reducing the number of infant deaths,” she explained. What she loves about Olay is how it is also able to multi-task to keep her looking youthful through the years. Just as Olay is celebrating its 10th year anniversary in the region, Ines Delgado-Prieto, an Olay Ambassador during the 2006 launch, is herself celebrating her store, Itsie-Bitsie Boutique’s 10th anniversary. “The boutique has really developed a devoted following of clients who look for a highly edited collection of sought after fashion brands sourced from all over the world. I manage all the facets of the business from the buying to the operations management, marketing, etc. Harpers Bazaar Singapore rated Itsie-Bitsie Boutique as "the opium den of the hopelessly fashionable," she shared. Ines’ other focus is her family. She still remains as youthful looking as ever with Olay, even after having 2 children to take care of. 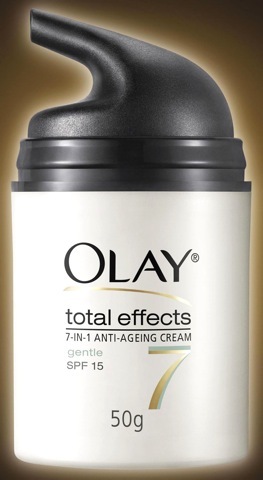 “Since I don't use make up much Olay Total Effects has been a very good daily facial moisturizer. It has kept the skin on my face smooth and blemish free. It's very affordable and it's a 7-in-1 anti ageing moisturizer with SPF. I don't have to use many different creams and products for my face!” Ines said. Menchu Lauchengco-Yulo, has once again proven her considerable acting talent by winning the Best Actress in a Musical Award by Philstage Awards for the Performing Arts for her role as Mrs. Lovett in Sweeney Todd. Now she is all ready for a new challenge - becoming the Associate Artistic Director of the Repertory Philippines this 2011. Yet even as she moves on to even bigger roles in her life, whether in front or behind the stage, Menchu is still sticking with Olay Total Effects – just as her mom did. “I grew up seeing Olay in our house – my mother always used it and swore by it. Back then it was in a bottle with a black cap, it was pink. Olay has come a long way since – for me, I use Olay Total Effects everyday. I am 47 years old but Olay has really worked for me as though it really slows down the ageing process. There was a time my skin was looking so dull because of the make-up I need to put on for a show but Olay really brought back some life to my skin. I can’t go by one day without using it,” said Menchu.